I have a confession to make: I have been terrible about meal planning lately. Between the travel and being sick and multiple meetings that include dinner, i just haven’t been planning out my meals the way I used to. I’m about to begin a hectic month of travel. In April I’m out of town more days than not and while I’m here this week, I decided I should plan what I want to eat before my travel starts. So I’m back to meal planning this week. Roasted salmon with rosemary and thyme. Inspired by this pin. My favorite soup – lentil soup with sweet potatoes and kale. Sweet potato chicken quesadillas, inspired by Rachael Ray. Roasted herb and citrus chicken via The Comfort of Cooking. Everything else that I’ll need I already have. So there you have it – what I’ll be eating over the next few days. Who else plans their meals for the week? What tips do you have so I can stay on track with meal planning? If I don’t weekly meal plan we eat junk, so I have to stick with it. 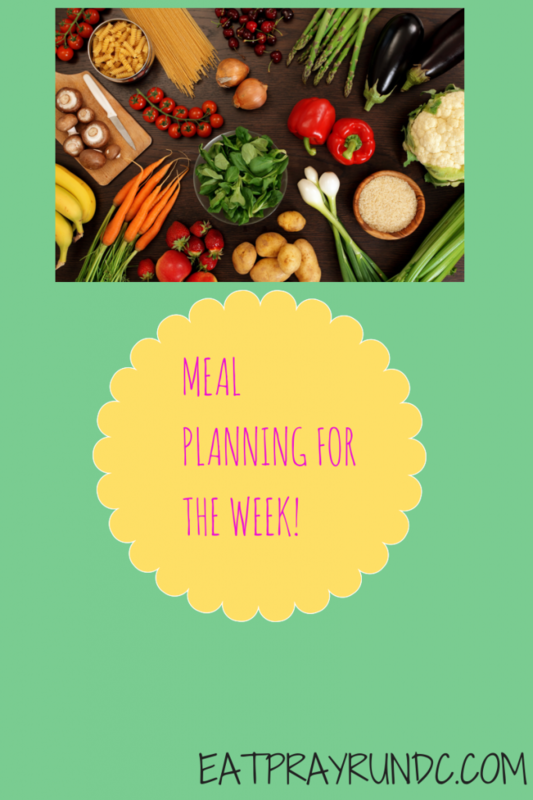 This weeks meal plan includes a salad at every meal and sneaking extra veggies into every dish for the kids. I love that people meal plan! Sometimes I try but it never works out! So then of course this results in food that needs to be thrown out cus it had gone bad cus I never made it. So frustrating! Meranda@fairytalesandfitness recently posted…One year of Blogging Questions and Comments: Who Can Help? I’ve fallen off the meal planning wagon the past month as well. The salmon looks AMAZING! That soup sounds delicious! We always meal plan for the week before we go get groceries. And I always cook more servings of a meal than needed so we have leftovers for later in the week so I only have to cook 2 or 3 times a week. I’d only be fooling myself if I thought we were going to cook dinner every day. I also am terrible at meal planning!!! I am really wanting to change that though, so we’ll see :)!!! I am excited to have found your blog!!! I came across it while looking for runners in my area. We just moved to MD from Iowa! My husband is a Pastor of a church in Westminster MD, he also makes weekly trips to DC to do lobbying!!! Look forward to following you! Jen@milesandblessings recently posted…Big News Day!!!! The sweet potatoes chicken quesadilla sounds awesome! I have to write everything down to stay on track…I’ve been advised to make larger portions so that I have to cook less during the week.